Find your favorite couch or ottoman, and put your legs up so that the hips and knees are at 90 degrees. Notice where the back of your head contacts the floor, take note if your shoulders are resting comfortably on the floor or are they rounded forward. Is your low back touching the floor? After about 5 min., notice if anything feels different…….. This exercise begins the realignment of the shoulder girdle with the pelvis. This post is neither Pain Free nor Egoscue related. We would simply like to share a photo with you that made us feel proud, touched and honored. This is one of our clients. His name is Kean. Each time Kean comes into the office, he brings us gifts. Be it flowers, fresh apple cider or even jelly beans, Kean’s gifts are reflective of his big ole heart. Kean is holding a photo of his son, also named Kean, who is serving our country overseas. We would like to honor both Keans for serving us as individuals and as a country. Both of these men enrich and inspire our lives. We have fun here at Pain Free Performance. You should come visit! Why do so many suffer from back pain??? The symptoms of back pain can vary from low grade aches to full blown back spasms. The urgency to solve the back pain consumes your life and drastic treatment procedures are pursued without a second thought. Anyone who has suffered through a severe back spasm knows how excruciating it really is. These spasms are so intense it seems this kind of pain is in a class of its own. This type of pain is so unbearable that it has been known to prevent people from being able to think straight. One of the best ways to treat back pain is to stop it before it happens and when it does happen, find a way to break the spasm before it accelerates to full blown. The best way to prevent back pain without drugs, surgery or manipulation is knowing the correct way to exercise and function in every day life. When you know what the cause of your pain is, only then will you have the ability to know how to prevent it. Keeping your body healthy and flexible is key, it’s all about knowing how to take care of yourself. Proper nutrition helps in the flexibility of muscles and allows them to heal faster should they get pulled or torn. Also, certain stretching techniques and having proper posture while exercising is essential to preventing back spasms and residual pain. For those who suffer from degenerative disc disease, spondylolisthesis, spinal fusions or scoliosis embody the symptoms of a chronic condition. Sufferers can help their conditions by focusing attention on the muscles involved in stabilizing the body’s skeleton. These very important muscles should be kept strong, flexible and balanced in all movements. The spinal column is composed of 33 individual vertebrae, stacked one on top of one another, and threaded with the spinal cord. The spine can be looked at as the drive shaft as its unique shape allows the body to pull off extraordinary balancing acts on a daily basis. However, the muscles are also essential, not only to retain the spine’s shape but to hold it erect. Conversely, inactive, atrophied, and compensating muscles alter the lumbar, thoracic, and cervical spinal curves. Over time in the body’s improper movement and malnourished lifestyles, the magical S-Curve diminishes, taking with it the spine’s flexibility, load-bearing strength and shock-absorbing capacity. Abandoned by the muscles, and losing the integrity of its curves, the spine is at the mercy of gravity. Rigidity sets in and the body does what it does best and protects itself by throwing the muscles into contraction. Eventually, the spine reaches its limits and it begins to stiffen the posture in a compromised flexion position. The result is chronic back pain; the cure is proper nutrition and knowing your body’s limits. Don’t push yourself; if something’s too heavy than don’t lift it; if you feel yourself experiencing pain while sitting at your desk everyday, adjust your surroundings. Make sure your chair is properly positioned so your elbows are at a 90 degree angle on the desk and your eyes are parallel with the computer screen. These small gestures can go a long way in preventing future chronic back lower back pain. GETTING OLDER DOES NOT HAVE TO HURT! Doing a simple menu of exercises designed to correct the dysfunctions in your body will keep moving for a lifetime. The Egoscue Method recognizes that fundamental anatomical, physiological and biomechanical principles govern the human musculoskeletal system. With only very rare exceptions, each person is born with certain core design characteristics that serve as a strong, resilient and efficient operational platform. By using a blueprint of this extraordinary platform as a guide, the goal of the Method is to eliminate disparities that can occur when injuries or negative lifestyle conditions affect the way the musculoskeletal system actually moves as opposed to its underlying structural parameters. By restoring muscular balance, skeletal alignment and the harmonious interplay of internal systems, the body takes a quantum leap in healing power, stamina and physical capability. The Egoscue Method is not a form of treatment that chases after short term, symptomatic relief. Rather, symptoms provide a common sense starting point, a working frame of reference based on each individual’s unique combination of strengths and limitations. Our primary objective applies to everyone we seek to help—to eliminate musculoskeletal system disparities and the resulting postural dysfunctions that interfere with pain-free living. A key part of the “blueprint” we refer to is familiar to all health professionals—it is known as the standing normal anatomical position. Without being overly technical the hip, knee and ankle joints are aligned vertically in paired stacks, each of which is subdivided by three horizontal parallel planes that extend through the joint pairs, creating what amounts to a partial dynamic load-bearing grid. The grid’s structure is completed by the shoulder joints which are in a functional interactive relationship with the major joints below instead of being aligned vertically like the others, although they too (the shoulders) operate individually and as a pair on a fourth parallel horizontal plane.Topped by the head, placed over the S-curved central spine that links the hips and shoulders, the grid allows upright posture and bipedal motion capable of a great range of movement. In addition, there is only temporary incidental rotation in the pelvis, legs, knees and ankles. (Think of rotation this way: Looking straight down on your upright body from above, draw a imaginary clock face with your head in the center facing twelve o’clock. In design position a straight line runs from hip joint to hip joint starting at nine o’clock and extending through the other hip joint, exiting at three o’clock. In such a configuration, there is no rotation, but if the lines depart from nine and three, say ten and four, rotation is present as the hips move off the design plane. This analogy works for the other load-bearing joints and the big leg bones. It is not unusual to find left-to-right pelvis rotation and right-to-left shoulder rotation.) The body is intended to rotate by twisting and turning, ascending and descending, in reaction to variations in the terrain and other temporary situations and then return to vertical alignment. When it remains stuck in rotation the integrity of the structure can be compromised. As you probably have concluded by now, the load-bearing grid we have just described means that vertical and horizontal alignment is all-important to both the musculoskeletal system’s structural integrity, smooth functioning and full, pain-free capability. An individual whose body deviates from this design must do so for a reason. That reason is, (in cases that do not reflect past injuries), a muscular imbalance in strength and/or flexibility. An individual’s standing, static posture provides essential information to our therapists in predicting what the body will do as it moves. These predictions can be confirmed and often reinforced by observing the patient’s gait, the way he or she strides forward, turns and executes other routine maneuvers. In the process, changes in muscle tension/length may be detected, along with atrophy of underutilized muscles or damage to over-used muscles that results when one group of muscles is repeatedly substituted for another that is more appropriate to the task. Such postural anomalies, we describe them in general as “dysfunctions,” directly impact joint mechanics. This weekend marked Charlottesville’s largest annual all-female event: The Women’s Four Miler. Here is a great article that we had circulating as all the women arrived on Friday night. Running should be PAIN FREE! More than 24 million people run in the United States alone, but 65% will have to stop at least once this year because of injury. Others will choose to run through the pain. Why the injuries? Why the pain…POOR POSTURE and POOR ALIGNMENT! We know that muscles pull bones in order to move. When a body is imbalanced, some muscles are working overtime pulling the bone or joints out of alignment. Other muscles become weak because they are not able to work the way they were designed to. If you run with the body in poor alignment, stress or friction occurs in the joints and very often pain develops. Pain is the bodies warning signal that something is wrong! At PAIN FREE PERFORMANCE, we believe that good posture is the cornerstone of proper running technique. When your postural alignment is correct, the body moves efficiently in much the same way that water will flow through a straight pipe more easily than a bent one. Running with your body out of alignment can create tension, fatigue, discomfort, and even PAIN. 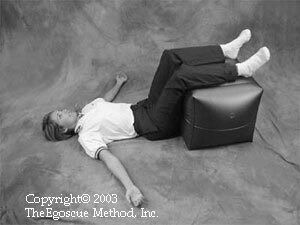 The therapists at Pain Free Performance utilize the EGOSCUE METHOD to restore postural alignment. We do not focus on symptoms; instead, we look at the entire body and determine the SOURCE of your dysfunction. We take photos; analyze your gait and perform functional tests to determine which muscles are dysfunctional and which muscles are compensating for the improper alignment. An individual program is designed to include passive positions and gentle exercises which will unlock restrictions and guide the body back to optimal alignment and function. This program provides “tools” for you to take care of your body for a lifetime. Learn how it can help you abolish pain and restore your body to its proper design.